The Rosa-Calming Serum is a concentrate for topical application on the face. Flavonoids strengthen the small capillaries and the walls of the blood vessels. With regular use, the highly concentrated active ingredients in this serum gradually reduce the size and intensity of red areas. Pat onto cleansed skin mornings and evenings. Can be used on a long-term basis in order to prevent and reduce signs of couperose. Telangyn™ is a soothing tetrapeptide, which has been specially developed for the cosmetic treatment of couperose and telangiectasias. 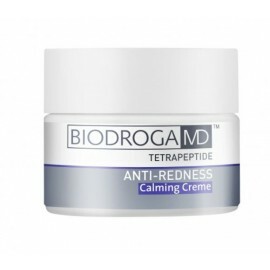 It counteracts reddening and the effect of collagenases (enzymes that break the peptide bonds between proline and other amino acids), which cause the breakdown of collagen. This active ingredient optimises the skin's firmness and elasticity, protects the skin's cells against hyperpigmentation and ensures a more even complexion. Quercetin protects against free radicals and helps to prevent the development of irritations. Rutin belongs to the group of the flavonoids and protects against UV radiation. It strengthens the small capillaries of skin. Salicin supports the effect of Quercetin and Rutin in a synergistic way and has an astringent effect. Red Wine Leaf Extract is known from medicine for the treatment of veins. It strengthens the tissue and the vascular walls of the small capillaries. Horse Chestnut Extract is also used in medicine for the strengthening of the veins. It increases the resistance of the small capillaries of skin. Liquorice Extract soothes irritated skin, reduces redness and protects against inflammation. SymCalmin® mimics the skin-soothing properties of oats. The skin becomes pleasantly relaxed and redness and itching are eased. Willow Bark Extract has anti-inflammatory properties. Chamomile Extract has a soothing effect. D-Panthenol helps to optimise moisture levels in the skin, promotes skin cell division and therefore the skin's own natural healing processes, reduces itching and makes the skin smoother. Shea Butter softens and soothes the skin. Argan Oil smoothes and firms the skin, while olive oil provides support for the skin's own natural protective film. Evening primrose oil gives the skin excellent support by promoting its natural regeneration processes. It also provides the skin with valuable Omega 6 fatty acids. DMC stands for Derma Membrane Complex can be described as "skin-similar" and mimics the skin barrier function and is guaranteed to have a high level of skin compatibility.